A majority of adults from all age groups believe that adult children have an obligation to support their aging parents. Overall, 75% of the public says adult children have a responsibility to provide financial assistance to an elderly parent if he or she needs it. Only 23% say this is not a responsibility. 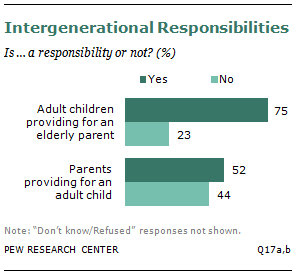 But adults of all ages are much more reluctant to say parents have a responsibility to support their grown children. Overall, 52% say parents have a responsibility to provide financial assistance to an adult child if he or she needs it; 44% say this is not a responsibility. Among young adults, many of whom may have found themselves in this very situation, 53% say parents have the responsibility to provide for their adult children, if their children need the support; 44% say parents do not have this responsibility. Young adults’ views on this issue are nearly identical to those of their parents’ generation. When Does Adulthood Begin in this Economy?